I really liked Pam Bachorz's Candor. I thought it was one of the more thought provoking YA dystopian novels I'd read, not settling to be merely sensationalized, it raised a series of thought provoking questions and had a bold ending. So I was really looking forward to Drought, her newest offering. 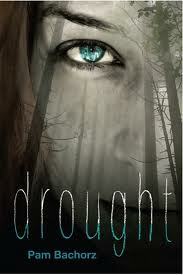 I've seen Drought classified as dystopian, but that seems wrong to me. I would say instead, it's a kind of fantasy novel that explores what life would be like in a cloistered, cult like environment. The world outside the woods where Ruby lives seems to function normally. But I'm getting ahead of myself. Ruby lives in the woods with her mother and the rest of their congregants. They all believe in their god, Otto, whose blood has sustained them. By drinking a drop of Otto's blood each week, they have managed to live for close to 200 years...their aging has slowed. Unfortunately, slowly after moving onto this land, they were trapped on it by landowner, Darwin West. They told him the secret to their health was drinking water collected off flowers, and now they are forced to collect water and dew off flowers and trees all summer long. Darwin sells the water. He treats them cruelly and beats anyone who doesn't meet their quota. Ruby is the youngest of all on the land. She doesn't remember Otto, but he is her father. He went away, leaving only vials of his blood. When the blood runs out, Ruby discovers her own blood has the same saving power. She becomes the savior in a way of her friends and family...but her mother won't let her tell anyone else. Ruby starts to imagine a life away from Darwin, but her mother doesn't think this is the solution. Ruby dreams of freedom but everyone's life depends on her blood. Will she go against the wishes of her loved ones to obtain freedom for herself? I have to admit that while reading this book, I had some major believability issues. I never knew why Otto and then Ruby's blood had this power. Were they vampires? Immortals? Huh? But the power was real. Ruby's blood would heal the wounds her mother got from beatings, and saves a life in the book. So it's not some sort of lie being told to control the congregants or Ruby. So with these questions, and the odd nature of the story, I felt disappointed when I first finished. But as I continued to think about the story, I realized that it's really quite a powerful examination of faith and control in many ways. Bachorz is the kind of author who very carefully chooses the names of her characters. It felt more obvious to me in this book than in Candor, but I was still gratified to see this is so on her blog. For example, we have a group of believing people who are suffering under the control of Darwin West. Whether you want to imagine Darwin stands for survival of the fittest or science, and West as capitalism and money, or something else entirely that I'm missing, is up to you. But I thought it was a fitting name for the role he plays. Ruby is a precious jewel, and her blood is of great worth. Many times the group is praying to Otto and having faith that Otto will reappear. However, power actually exists in Ruby's own blood, child of Otto. She decides at one point, that perhaps what is needed is a mediator, someone to bring their wishes to Otto. Her yearning to break free is heavily dependent on this. But all along, the power of salvation exists in Ruby's blood alone and while she allows them to inform her choices and impact her decisions, she is really the one who truly possesses the power. It isn't until love enters the picture that Ruby grows strong to begin to think on her own terms and make decisions that go against the grain of her indoctrination. This the reason I think that Bachorz is one of the most important writers of YA today. While you might find the story simply entertaining, for thoughtful readers there are layers of ideas to be explored--about the cultish life, faith, the power we have in ourselves, and self-sacrifice. Furthermore, it would seem Bachorz has a strong word to say about parents. In both Candor and Drought the single same gendered parent of the protagonist is the true oppressor. It is only in rising above the parent's wishes and acting in defiance of them that the protagonists achieve freedom and knowledge of self. And once again in both books, love serves as the impetus for change. Drought is in that case a fascinating, slightly odd book that provides a searing examination of self, faith, community, freedom, and the struggle over ideas.